The DTM or the German Touring Car Championships continues to enjoy a worldwide popularity among the racing buffs. Its exciting competitions performed by highly tuned 2.5 liter machines are often called the pinnacle of the world's touring car events. In 1996, this popular series was re-established as the International Touring Car Championships (ITC), with races held not only in Europe, but also in Brazil and Japan. The famous Italian car manufacturer Alfa Romeo has been one of the principal figures in the series since its first entry back in 1993. For the 1996 season, their 155 V6 TI was further developed and a total of eight cars were entered from three different racing teams. Its high revving V6 cylinder engine was said to yield an awesome 450 plus horsepower output. This tremendous power was transmitted to all four wheels via a semi-automatic 6-speed transmission and electronically controlled front, rear and center differentials. The four-wheel double wishbone suspension was equipped with horizontally mounted shock absorbers activated by pushrods. The exterior, although retaining some of the original appearance, underwent numerous aerodynamic and weight saving refinements. The Martini sponsored 155 V6 TI's were piloted by the talented drivers N. Larini and A. Nannini. 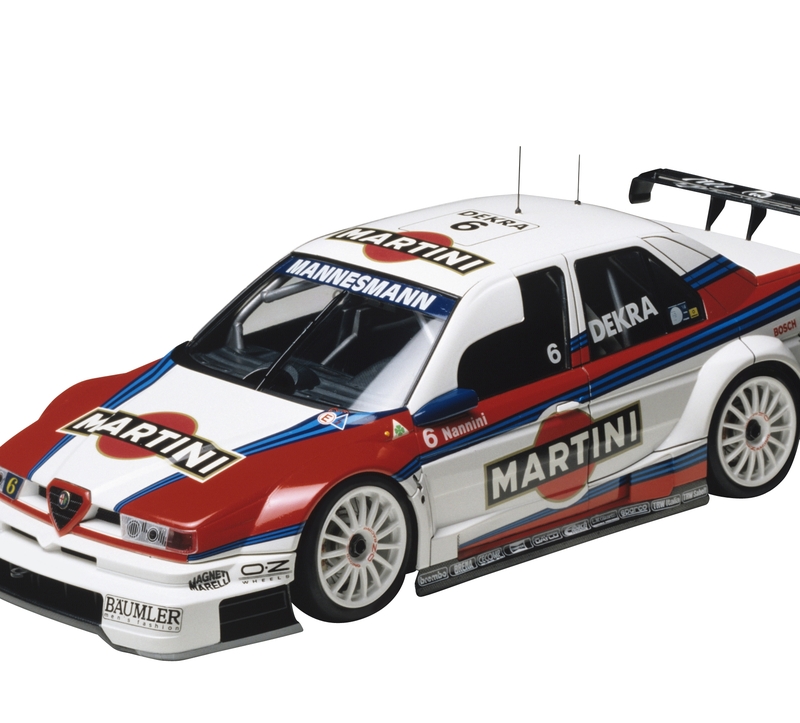 With its eye-catching color scheme and aggressive performance, the Martini Alfa Romeo 155 V6 TI pleased the racing fans throughout the 1996 ITC season. •	The V6 engine is recreated in great detail, with separate parts depicting air funnels and intake. Engine hood can be opened. •	Interior features roll cage, bucket seat and instrumentation details. •	Markings are included to recreate the distinctive Martini-sponsored cars of Driver’s Nannini and Larini. 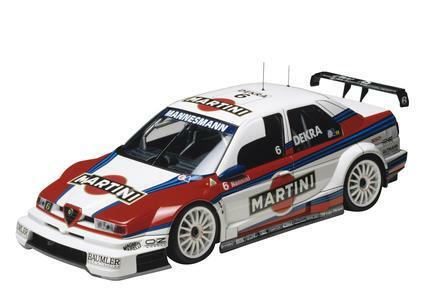 Special Feature 6 Markings are included to recreate the distinctive Martini-sponsored cars of Nannini and Larini.